Tito Sewer never jumped out of an airplane during his service in Vietnam. It was too risky. Sewer served in the 101st Army Airborne Division and, as a “Screaming Eagle,” was trained for air assault operations. But in Vietnam, where it was too risky to jump out of planes because of the chances of being shot by the enemy, he rappelled into action instead. GCU employees gather before their visit to the Arizona State Veteran Home. The native of the U.S. Virgin Islands liked the excitement of the 101st — shrinking violet he is not — and served in the military for 23 years before settling in Phoenix, moving here “on a dare,” he said with a smile. It’s just one of the stories Grand Canyon University employees collected and slipped into their memory banks as part of the University’s eighth annual Salute Our Troops. 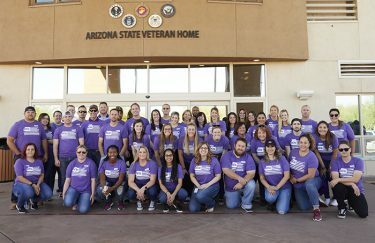 About 50 GCU military division employees on Wednesday loaded up four passenger vans and headed to the 200-bed Arizona State Veteran Home, nestled between the Carl T. Hayden Veterans Affairs Medical Center on Indian School Road and Steele Indian School Park. 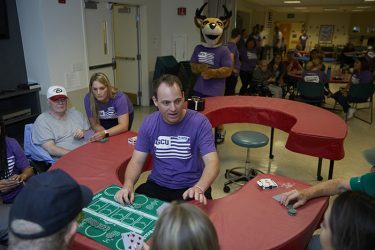 They played Texas Hold ’Em poker with the veterans, all of whom are receiving medical and rehabilitative care at the facility. They shot Nerf guns at bottle targets, played bean bag toss, belted out military fight songs, listened to a song or two by the Doors, and joked around with GCU mascot Thunder, who was in fine form. But, most of all, they spent time at the skilled care nursing facility talking and sharing stories as Memorial Day fast approaches. Adam Ursetta, university counseling manager, has volunteered for Salute Our Troops several times. He said his favorite part of the event is hearing the veterans’ stories. Ursetta’s father served in the Korean War and on the USS Wisconsin, an Iowa-class battleship that also was part of the Pacific Fleet in World War II and was called into action when Iraq invaded Kuwait before being decommissioned in 1991. Employees — and Thunder, of course — spread good cheer. His dad spent some time in a care facility, so he felt it was especially important to give back. He remembers how “some of them (in the care facility) didn’t have family or didn’t have kids who lived in town” and didn’t get a lot of visitors. He remembers one veteran who played for the University of Nebraska and was in the Football Hall of Fame. He carried his Hall of Fame plaque with him: “He was proud to walk around with that plaque,” Landauer said. The other thing he loves is seeing the veterans’ faces light up. Chris Landauer serves as the dealer for Texas Hold ‘Em Poker. Danielle Baker, a university counselor, spent some time talking to veterans as they ate refreshments provided by Canyon 49 Grill. She listened closely to one veteran, always making eye contact with him. Her dad served and her brothers are in active duty with the Navy. It was her third time being a Salute Our Troops volunteer. “You get to meet so many cool people and hear their stories; you get a different perspective of history. You hear those stories firsthand. … You get to hear their lives,” said Baker, who also volunteered at the popular Nerf gun target practice area (the room of GCU employees cheered every time a veteran hit the target, which was often). Student services counselor Tiffany Banner said it was her fourth time to be a part of Salute Our Troops. Learning how to get their Lopes Up was part of the fun for the veterans. Debbi Artz, student services counselor, has volunteered for Salute Our Troops six of the seven years she has been at GCU. 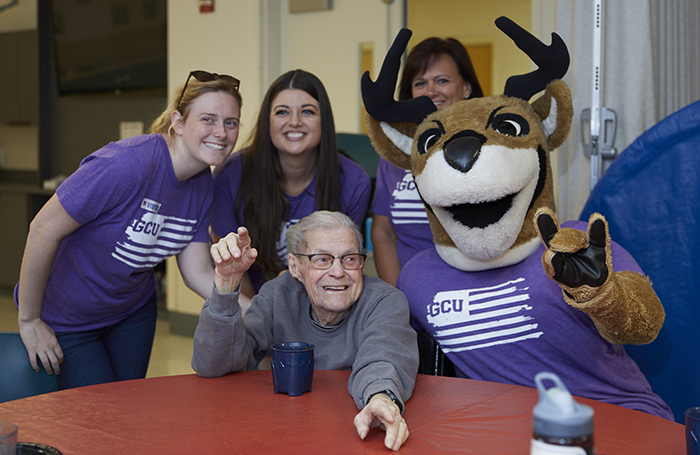 Not that GCU’s employees were the only ones who were appreciative of their few hours with the veterans. You can reach GCU senior writer Lana Sweeten-Shults by email at lana.sweeten-shults@gcu.edu or at 602-639-7901. Follow her on Twitter @LanaSweetenShul. Thank you to each participant in this dedicated effort, by GCU, to never forget our veterans and the sacrifices each made for our great nation. Bless you. I want to give credit and honor where credit is due. In 2010 two incredibly amazing University Counselors (Roz Tejeda and Shawn Harper) had transferred into the Military Division from the Nursing Department on Team Amazing. Immediately they felt the need to do something positive to celebrate our veterans as we currently had nothing of the kind in place. They met with our SVP and Manager Regina Madden to see if this would be feasible and to their elation this was approved. Roz and Shawn haven’t been fully given the recognition they deserve for implementing such an impactful event and helping to brand GCU with the veteran community. This event has been successful and going strong for the past eight years. a friend posted this on my FB page of everyone and my dad! Such fun! He is a WWII vet and also served in Korea. Thank you so much for writing this and to GCU for supporting our veterans!